insert the disc and launch it ? (12-02-2015, 07:30 AM)jesalvein Wrote: insert the disc and launch it ? after a crash, doin't launch pcsx2 again, and get my documents\pcsx2\logs\emulog.txt (or pcsx2 main directory\logs\emulog.txt if you' using the binary package) then post its content here. 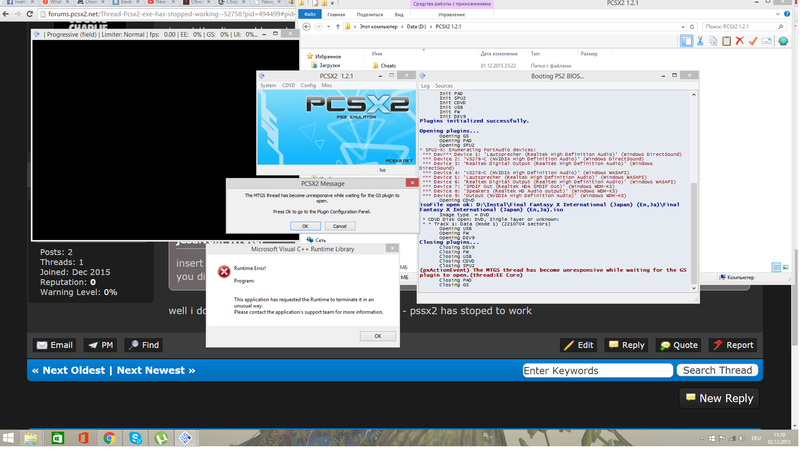 (12-02-2015, 12:15 PM)jesalvein Wrote: after a crash, doin't launch pcsx2 again, and get my documents\pcsx2\logs\emulog.txt (or pcsx2 main directory\logs\emulog.txt if you' using the binary package) then post its content here. (12-02-2015, 02:33 PM)jesalvein Wrote: tried updating directx ?